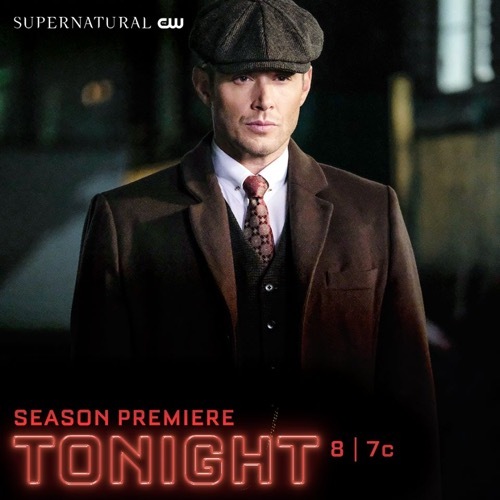 Supernatural airs tonight on the CW with an all new Thursday, October 11, season 14 episode 1 premiere called “Stranger in a Strange Land,” and we have your Supernatural recap below. On tonight’s Supernatural episode as per the CW synopsis “The Season 14 premiere: Sam enlists everyone’s help in trying to track down Dean, who can literally be anywhere. Tonight’s episode is going to be great and you won’t want to miss it, so be sure to tune in for our Supernatural recap between 9 PM – 10 PM ET! While you wait for the recap make sure to check out all our Supernatural recaps, news, spoilers & more, right here! A possessed Dean pays a visit to a man named Jamil who is praying. He reveals that it is the Michael. Jamil is terrified. He asks Jamil what he wants. Jamil is stumped but asks for peace and love. Michael recalls all of Jamil’s past indiscretions that contradict his wishes. Michael flings him across the room and tells him he isn’t worth saving. He tells Jamil he wants a better world. Sam comes home to see his mother in the bunker. Mary updates him on all their efforts in the last 3 weeks to find Dean. Sam tells her his trip to Atlanta was a bust. They talk about their current case, vamps gone wild. Sam deals out some orders to the group. Mary is worried about him. He tells her he is good. Meanwhile, Bobby is teaching Jack boxing. Cas is at a local bar. He meets with a demon. He asks if any demons know where Dean might be. The demon wants something for answers. Cas threatens to burn him into ash. Half the bar stands. They are all demons. Cas gets up to fight. They all beat him down. Sister Mary Jo says goodnight to some members of the parish. She heads home on the dark street. Michael comes to see her. She realizes it isn’t actually Dean. Michael wants to talk to her. Sister Mary Jo is confused – why would Dean let himself be possessed. Michael says for love. Michael asks her what she wants. She jokes, listing off Chanel, Dior… He knows that isn’t true. She wants love and to belong. Sam goes to see Jack. Bobby told him that Jack had a bad day. Sam feels for him. He is without his grace and powers. Mary interrupts. Nick is awake. Sam checks in on him. He looks sad and defeated but tells him the nightmares are getting better. Sam helps care for his wound. Nick doesn’t get how Lucifer could die but he lived. Nick reveals that he wasn’t told where Dean was but knows Michael said he wanted to do things differently this time. Sam gets a call from the demon holding Cas. Sam readies his weapons while Mary warns him it is a trap. Sam tells Mary she is with him. Bobby and Maggie will stick together. Jack wants to go too. Bobby objects, but Sam says fine. Cas asks the demon why he is being used as bait. The demon shares that he needs something with Sam. The demon says he recently had a revelation when someone asked him what he wanted. Now he knows – everything. Mary tries to console Sam on their ride there. Sam tells her he doesn’t need to be comforted. Meanwhile, Bobby assures Jack he has his back. They all arrive. Sam gives Mary the demon-killing knife. He heads into the bar. The demon meets him while another pats him down. The demon calls him his Beyonce, he is a legend. He introduces himself as Kip. Sam wants to know what he wants. Kip wanted him to come alone. His men bring Maggie and Jack in. Now he wants to make a deal with more in it for him since Sam didn’t follow the rules. Kip shares that he has volunteered to be the king of hell since no-one else has and now he wants to work with Sam as Crowley did. Sam points out that he is no Crowley. Kip gets angry. Sam tells him no deal. Bobby and Mary come in with guns firing. They all fight. Bobby goes down and Jack tries to fight for him. Sam tussles with Kip and the knife Mary gave back to him. Sam takes him out with the knife. Sam yells enough. He tells them there will be no new king of hell. If anyone wants the job they need to come through him. All the demons exit their bodies. telling him he did well. Jack is mad. All he did was get punched. Cas tells him he will be fine. He will get his grace back and then they will all work as a family to get Dean back. Sam gets a call. It’s Jo. She tells him they have a problem. Meanwhile, Michael is teaming up with a vamp.